Tron Price is up 18.5 percent in the last week. At spot prices, Tron (TRX) is up 18.5 percent in the last week and poised for more gains thanks to favorable fundamentals and technical candlestick formations. Any surge above 2.5 cents would trigger bulls aiming at 4 cents or higher. It may appear so near, yet it is technically too far. TRX prices, despite the Tron Foundation partnering and welcoming defecting dApps from Ethereum, is struggling to break above 2.5 cents. From previous TRX/USD trade plan, this is the main resistance level and round number meaning should traders muster enough momentum—spurred by technical or fundamental factors, then the resultant wave of higher high could propel TRX prices towards 4 cents as bulls begin recouping 2018 losses. In the meantime, TRX is up 3.1 percent in the last day and a massive 18.5 percent in the previous week at the time of press. 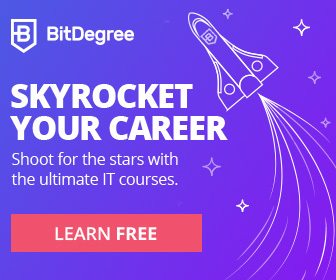 Days after BitGuild defected to the Tron platform, EtherGoo is has followed its footstep to become yet another Ethereum gaming dApp to switch camps in less than two months. EtherGoo will now change names to TronGoo and considering its significance in the Ethereum network; we might see Tron platform transaction spike as the game was popular in the Ethereum ecosystem. By switching sides, TronGoo will undergo a facelift and aside from the improvement in the gaming balance and interface, it shall be compatible with mobile. However, these developments came as no surprise. Justin Sun’s overall objective is to see Tron evolve into this excellent platform attracting gamers from all over the globe. As a multi-billion industry, dominance will mean value and consequently TRX will inevitable surge—even to 10 cents. So far, TRX is up one spot to 10th flipping Cardano (ADA). With a market cap of $1.52 billion, we expect a resurgent crypto market to lift TRX prices above 2.5 cents. From candlestick arrangement, this is likely to print out in the coming days because not only are transaction volumes increasing, and prices are edging higher confirming the double bar bull reversal pattern of Dec 2018. Besides, after a brief correction early this month, prices reversed printing higher right off the 38.2 percent Fibonacci retracement level. As such we expect TRX bulls to rally above 2.5 cents and because of this we recommend traders to buy at spot prices with stops at 2 cents. After peaking on Dec 21, TRX volumes are picking up, and Jan 4-5 higher highs at the back of above average volumes is a stamp of approval hinting of underlying bull momentum. Up-thrusts above 2.5 cents will signal trend continuation and a break above 2.5 cents—a minor resistance level. 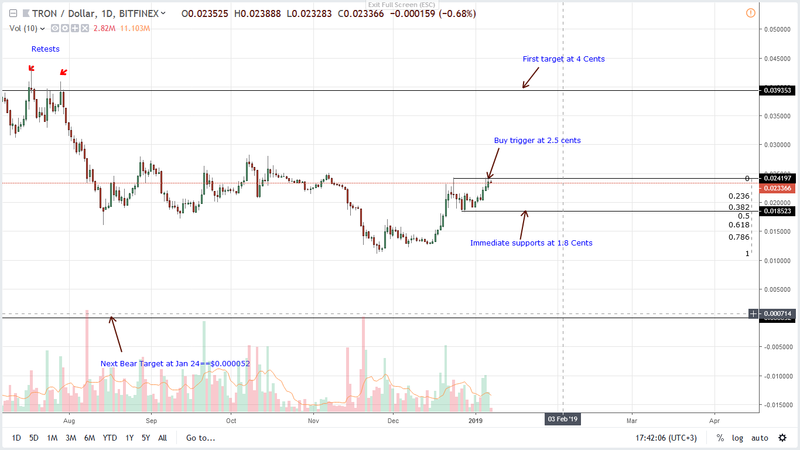 The post Tron Price Analysis: TRX up 18.5 Percent, Breakout Likely appeared first on NewsBTC.